Why Is Everything a “Body Slam” to the News Media? As America prepared to celebrate its first birthday under the Trump administration, the 45th POTUS was reveling in a repurposing of his pro wrestling past. 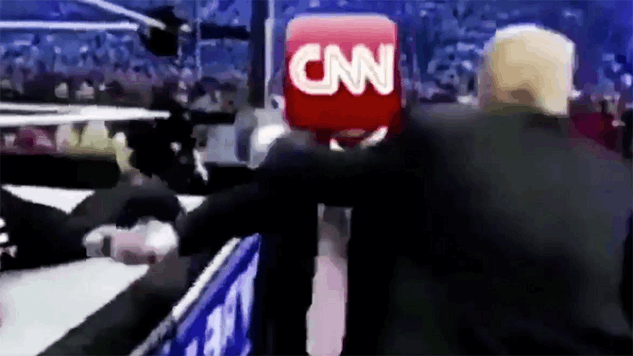 A now-disgraced Redditor edited a clip of Donald Trump attacking Vince McMahon at WrestleMania 23 by placing the CNN logo over the WWE chairman’s face, and Trump unsurprisingly shared it on Twitter. The response to the president’s endorsement of the meme was overwhelmingly negative, with many in the media alarmed at its implication of violence against journalists. As a sensible person who’s constantly sickened by everything Trump does, I shared that concern completely. But as a wrestling fan, I had to take umbrage with the terminology being so widely used in news coverage of the story. Headlines from Variety to Newsweek to the New York Post all reported that the video depicted Trump “body slamming” CNN. Body slamming?! Not even close. It’s quite possible that the term is still resonating from last May when a different Republican politician, the since-elected Governor of Montana Greg Gianforte, actually attacked a journalist, Guardian reporter Ben Jacobs. While no footage exists, the audio recorded during the incident features Jacobs telling the then-candidate, “You just body slammed me and broke my glasses.” In this case, when the likes of CNN, The Atlantic and Politico all published headlines about Gianforte body slamming a reporter, they were merely using Jacobs’ own words. But despite there not being video of the attack—and given that some accounts claim Gianforte grabbed Jacobs by the neck—it’s safe to assume a Montana Republican didn’t actually scoop up a reporter and hold him upside down before slamming him on his back. But, somewhat curiously, that’s the verbiage Jacobs went with in the heat of the moment. This is a body slam. Perhaps Jacobs was aware of the term’s previous use in his field when describing controversial acts of physical aggression. Just a month before the Gianforte incident, The Washington Post published an article titled, “Video Shows Male Police Officer Body-Slamming College Student On Sidewalk.” The video reveals a Fort Collins, Colorado police officer abruptly sending a 22 year-old woman to the ground face-first outside of a bar. In April of 2016, a similarly controversial video surfaced, causing Newsweek to report, “Investigation into School Police Officer Who Bodyslammed Student in San Antonio Launched.” Four years prior in August of 2012, The Blaze published “Shock Surveillance Video Shows LAPD Officers Body-Slamming ‘Defenseless Woman’ Into the Pavement During Violent Arrest.” Both of these videos, much like the incident in Fort Collins, depict an officer forcing an accosted individual to the ground face-first. And though these documented cases of police causing unnecessary harm to far-from-threatening civilians are being reported on in a serious manner, there seems to be an unbreakable habit of referring to this particular type of actual violence as if it’s somehow inspired by a maneuver from a scripted sport. In fairness, there’s really no reason for any given journalist to know what technically constitutes a body slam. The average person in 2017 doesn’t watch professional wrestling—the number of viewers is nowhere near where it was during the Monday Night Wars or Hulk Hogan’s heyday in the ‘80s. And let’s be honest, “bodyslam” sounds generic enough that it’s easy to see how it could be applied to anything resembling wrestling by someone who knows nothing on the subject. It’s not nearly as descriptive a name as say, a belly-to-back suplex. Though when a YouTube video titled “Best Football Tackle Ever of Belly-to-Back Suplex in Game” went viral, USA Today High School Sports went ahead and wrote the headline, “Middle Schooler Tackles with a WWE Body Slam; Should He Be Punished Somehow?” The name of the move this tackle resembled was right there in the video, yet they still called it a “WWE Body Slam!” As an aside, I’m sure Vince McMahon would love this implication that WWE actually created and therefore owns the rights to a move that indisputably predates his company. Cases like USA Today’s description of the high schooler’s unorthodox tackle point to the likelihood that, in many cases, “body slam” is just the easiest route when attempting to be concise and clear. It could also be similar to the way most people use “Kleenex” as a blanket term for all tissues—they know that refers to a specific example, but who really cares other than the vocal minority of Puffs enthusiasts. But if there is some sort of odd instinct within sports-entertainment neophytes to break out the term whenever a cop abuses their authority or a politician roughs someone up, then that could be a problem. The last thing pro wrestling needs is an intensified stigma. force” here is the apparent instinct to use the term, and the “immovable object” is the term itself, a tired trope that stubbornly continues to stick around. But as wrestling fans know, the immovable object can be moved, and I for one hope that happens soon. Trevor Courneen is an editor with Topix Media Lab and has written for Newsweek, WWE Magazine and more. You can follow his abandoned Twitter account @trevorcourneen.